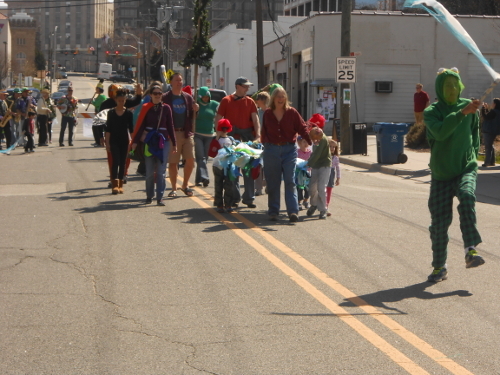 Frog leads the parade as the Bulltown Strutter strike up the band. Heading up the march is a Girl Scout troop with a frog pond. A state park ranger marches in is camouflage reversible salamander orange cape. Then more frogs, a zebra swallowtail butterfly, a ladybug on a leaf, a beaver, an opossum, a fox, a pileated woodpecker and a squad of woodpeckers and cardinals, a beehive, a unicorn, a few dogs, and two stroller-riding babies at the end.